This is only my second “Alix London Mystery” although it’s the fourth in the series, and already I’m a convert and tremendous fan. Although probably considered to be a ‘cozy’ mystery – something I’m generally not too excited about – there is plenty of grit and excitement here. And as I wrote about in my review of The Art Whisperer, the subject matter of fine art, and a ‘detective’ who has a knack for spotting art forgeries is a subject that seems quite topical and one that I can really get excited about. Alix London has really started to make a name for herself as ‘The Art Whisperer’ and she is featured in an art magazine that is read world-wide. What she didn’t expect was that a photo of her in her home would grace the cover of the magazine. Even before the magazine gets into circulation in the United States, Alix receives a call from an art dealer in Italy inquiring about a framed mirror in the background of the photo. The dealer has a client interested in either purchasing the mirror or having another one made. Alix informs the dealer that the mirror was a gift from a family friend, “Tiny” Abbatista, and is not for sale. 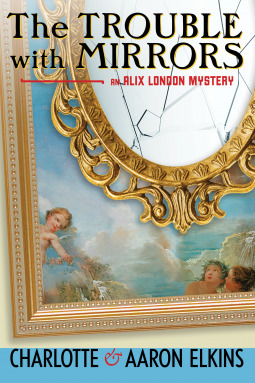 In short time, Alix’s house is burgled with the mirror in its frame the only thing taken. When Alix looks to let Tiny know about this, she discovers that he has disappeared and no one knows where he might have gone. So begins Alix’s discovery of her friend Tiny and the artwork in her own home. This is a quaint, perhaps even simple mystery. The end is visible from a little ways off, but the journey is still worth taking because what makes this story so much fun is the development of the characters. Alix London is truly a character that is interesting has some depth that we are still just beginning to touch upon. Her art world is full of strange and compelling characters – from the Mafia we see here, to people like Tiny who has a much deeper story than we might have suspected. There’s some romance here, though this is a sub-plot that’s been developing over the course of the series (that I’ve read). It was not quite as interesting to me, but it’s in the background enough to not bother me too much. This is great beach reading or fall sitting-on-the-porch reading. Looking for a good book? The Trouble With Mirrors by Charlotte and Aaron Elkins is an interesting mystery with wonderful characters and a subject that is unique and very real.